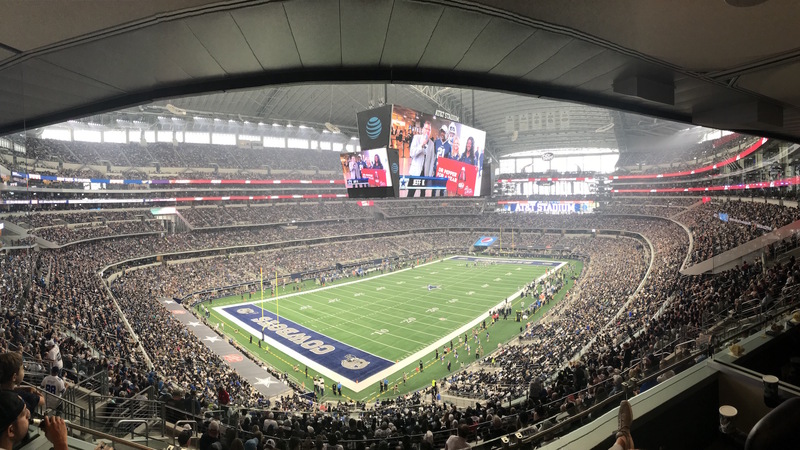 Home › Blog › Experience a Cowboys game like a WinStar VIP! Here at the World’s Biggest Casino, we know a thing or two about football. And with America’s Team right in our backyard, you know we’re big fans of the silver and blue. As the Official Casino of the Dallas Cowboys, WinStar World Casino & Resort is proud to offer VIP experiences for our friends at each home game during the 2018-19 season. VIP experiences include the use of our two suites at each game this season. One suite is field level, putting you in the middle of the action with the players and the Cowboy Cheerleaders. In this luxe suite, you’ll enjoy all-you-can-eat food & drink and event level seating. Our second suite in AT&T Stadium is part of the Silver Suites, which offers a more complete view of the entire field, comfortable chairs and all-you-can-eat snacks, food and drinks. You might even get a visit from a Cowboys legend! Each suite also has multiple televisions so you can keep up with other games in the league and your fantasy players. The VIP experience at Cowboys games doesn’t end with our suites. As a WinStar VIP, you could enjoy field access before and after the game. Another fun perk of being a VIP is catching a practice and lunch at The Star, the Cowboys’ $1.5 billion state-of-the-art practice facility. We also give away an entire WinStar experience to one lucky member of the audience each game. Winners receive a one-night stay in our lavish accommodations, $2,500 in free play, a round of golf at WinStar Golf Club for four and a $200 spa credit. With so much to offer, who wouldn’t want to experience a Cowboys game in VIP style? Learn more about the Cowboys’ remaining home games in AT&T Stadium and check your My WinStar account to see what offers you have available. Don’t have a Club Passport card? Sign up for one today and start earning points to become a VIP!